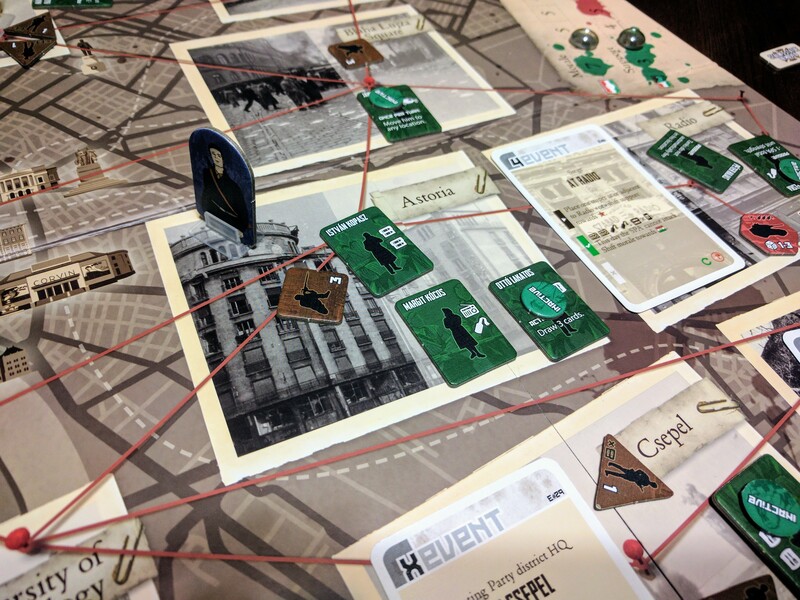 Days of Ire: Budapest 1956 is another cooperative title with a historical theme, so if you’re interested in Black Orchestra who’s I reviewed some time ago (check out the review here), but disappointed at the lack of availability or just want another historical co-op, Days of Ire just might suit your fancy. 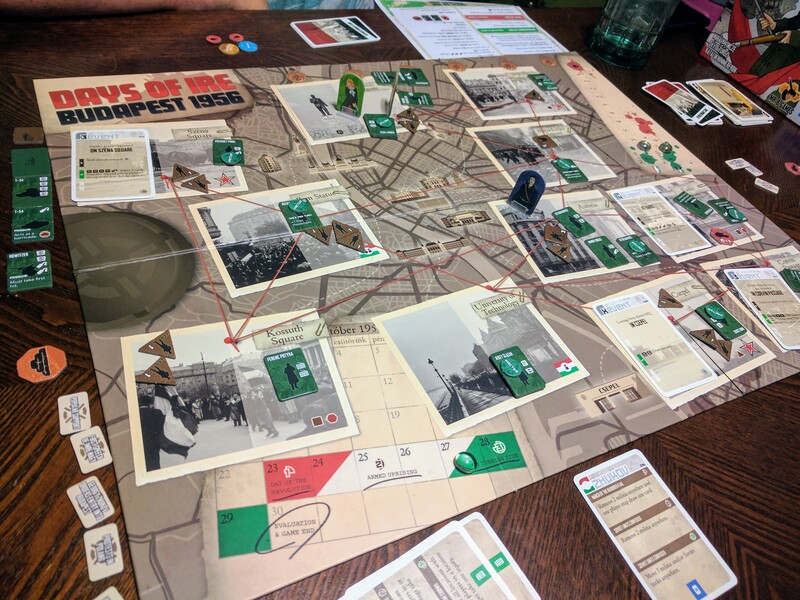 Days of Ire takes place during the Hungarian revolution against Soviet control. It requires the revolutionary players to resolve event cards, which show up on the various locations on the board. 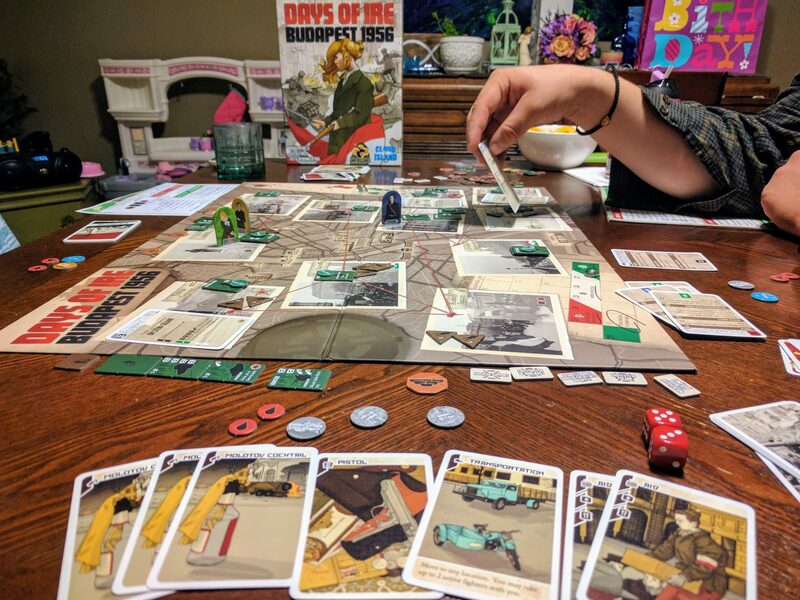 This isn’t entirely different from something like Pandemic, although what sets Days of Ire apart from these other cooperative titles is that although to win the revolutionary players just need end the seventh round with 4 or less events on the board. Completing these location events actually resolves in positive effects, such as drawing extra cards, gaining extra actions, resources, etc. This felt very different than many cooperatives where if you don’t complete a certain task the game beats you to the ground. In Days of Ire, however, doing the very thing that helps you win the game also resolves in a positive consequence. The result is players working together to complete the right events at the right time. Each event card is also based on real historical events, such as organizing a protest, gaining support, or basically doing things that revolutionaries do. Not that I have a lot of experience doing these things so you’ll have to pay the game to experience the cards for yourself, but sufficed to say they are thematic enough. Militia, snipers, and tanks will show up due to a event deck with some complex but intuitive mechanics that add a lot of replayability. Revolutionaries certainly do not want to be caught on the same spaces as these enemy units. The revolutionary players spend actions to recruit fighters, which follow you around the board, each helping you to resolve events and/or giving you special abilities. 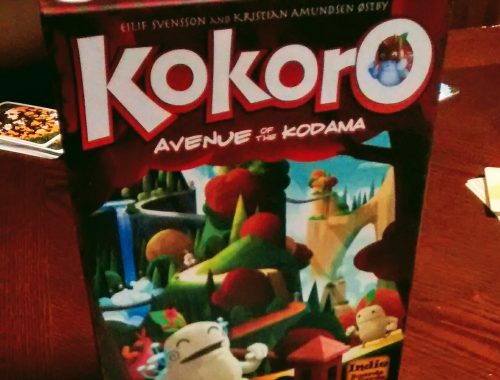 Overall, I think this is a fantastic cooperative title. We won our first play somewhat easily, though it was a bit challenging at times and we were playing in the recommended first game setup with 3 players. I am very much looking forward to playing the fully cooperative mode on a much more difficult setting to see how we fair. Days of Ire also includes separate modes which show one person to play as a Soviet general and a solitaire mode if you feel so inclined. The price tag is sightly high, but I definitely think you get your money’s worth in quality of gameplay. Days of Ire is a solid cooperative game with a great historical theme that I could see getting a lot more play. 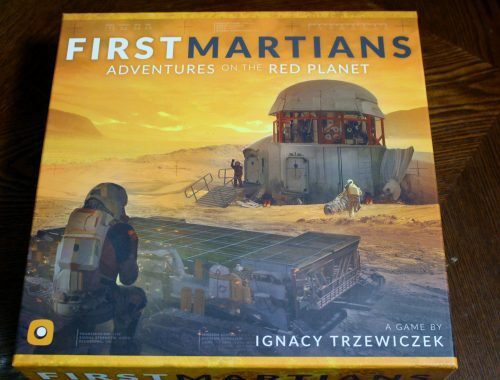 I’m giving it a solid 8 out of 10, and I’ll even give it a +1 if you really like cooperative games or you love historical games. Happy gaming!